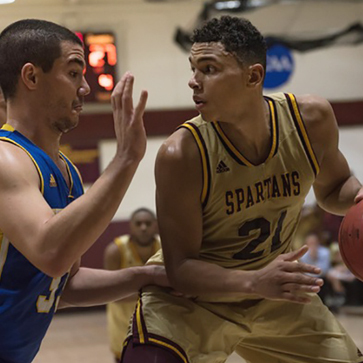 St. Thomas Aquinas College men's basketball alum Justin Reyes has become the first former Spartan to be selected in the NBA G League draft, taken as the first pick in the second round by the Salt Lake City Stars (Utah Jazz affiliate). Even after a playing career which included rewriting the men's basketball record book, Reyes continues to cement his status as one of the greatest athletes to ever don the maroon-and-gold. His four years in Sparkill included leading the Spartans to the first three East Coast Conference championships in program history, three straight NCAA Tournament appearances, three consecutive ECC Player of the Year honors, and his current status as the conference's all-time leading points scorer. With his 2,247 career points, Reyes stands second all-time in St. Thomas Aquinas history, and first in the program's Division II era. The Haverhill, Massachusetts native was one of just three players in the nation to earn First Team All-American status last season from Basketball Times, the Division II Conference Commissioners Association (D2CCA) and the National Association of Basketball Coaches (NABC), in addition to being a finalist for the prestigious Bevo Francis Award for the nation's best Small College player for the second straight season. During his four collegiate seasons, STAC amassed an impressive 102-29 overall record. Reyes was the 28th pick overall in the 2018 G League draft, the highest draft position ever for an ECC alum, and will play for the Stars. St. Thomas Aquinas College is an independent liberal arts college located on 60 acres in Rockland County, NY, which provides education at the undergraduate and graduate levels. The College’s 2,800 full and part time students can choose from more than 100 different majors, minors, specializations, and dual degree programs across three Schools: Arts & Sciences, Business, and Education. The College is recognized by U.S. News & World Report in the Top-Tier for Regional Universities, by Colleges of Distinction in both its New York and Catholic editions, by Affordable Colleges Online as a top College in New York for Return on Investment, and is included as a Military Friendly School®. St. Thomas Aquinas College is accredited by the Middle States Association of Colleges and Schools; its School of Education is accredited by the Council for the Accreditation of Educator Preparation (CAEP); and its School of Business is accredited by the International Accreditation Council for Business Education (IACBE). For more information, visit www.stac.edu.